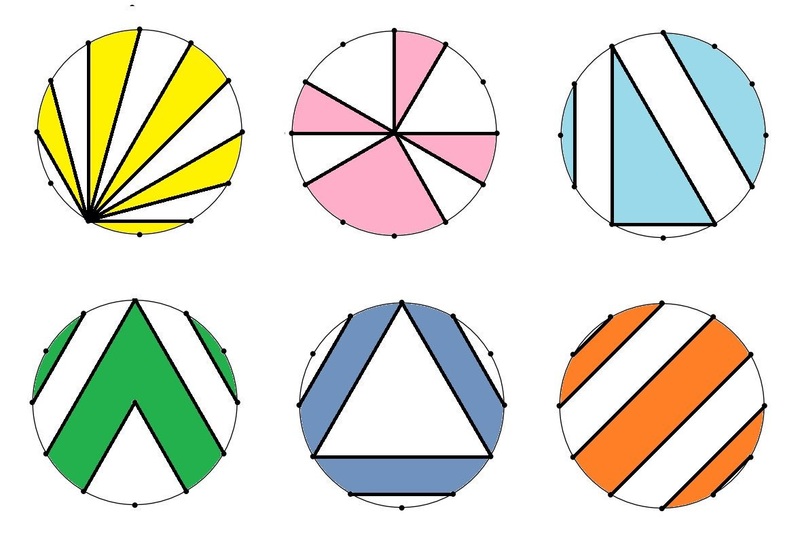 Last week Math With Bad Drawings published a bunch of geometry puzzles by Catriona Shearer. I’m about ready to talk about the first one! For the first five of these, I’m going to use one of two methods: Pairing off shaded regions with unshaded regions of the same area, or adding up shaded regions to make shapes of known area. Generally some dissection is involved in this. Here goes. This is the easiest. Each yellow shaded region is congruent to an unshaded region, and vice versa. Half the circle is shaded. Also easy. The three small regions are what I’ll call “one hour wedges” because if these were clocks, the outer arc would correspond to one hour. The large region can be divided into three one hour wedges. So we have six shaded hours in total, which is half the circle. Just slightly harder. 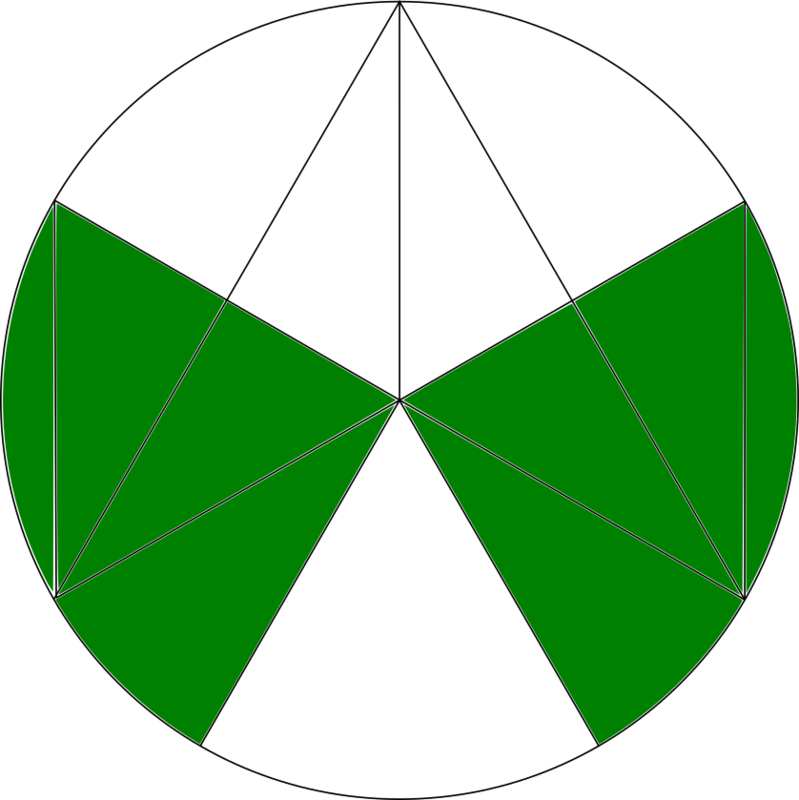 Notice the left shaded region is congruent to the bottom unshaded region. 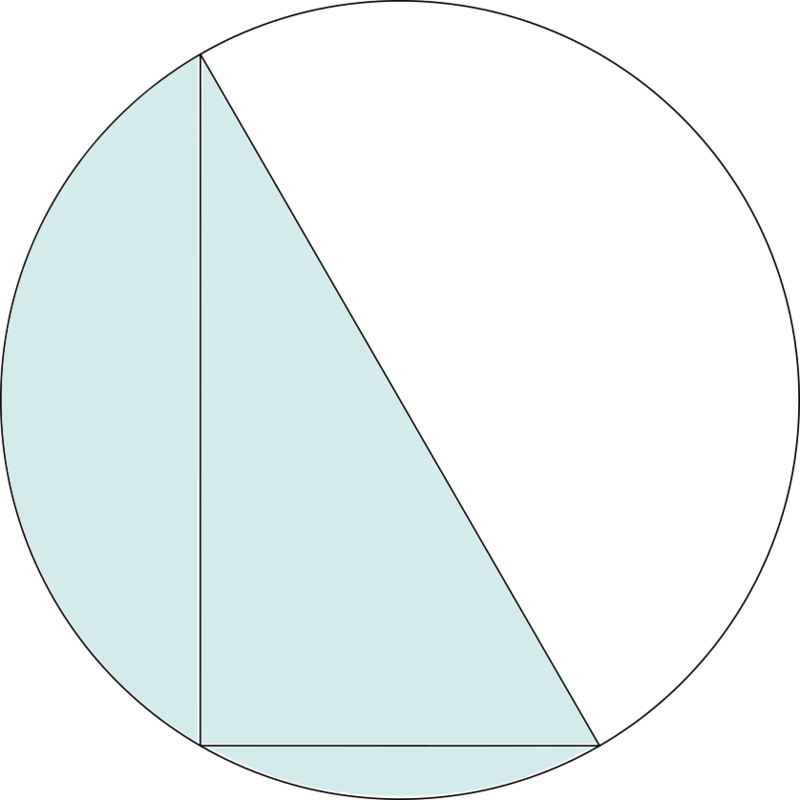 Move the shaded region to the bottom: And now the left unshaded region is congruent to the right shaded region; move the latter: and clearly the shaded region is half the circle. A little harder yet; we’ll have to dissect. 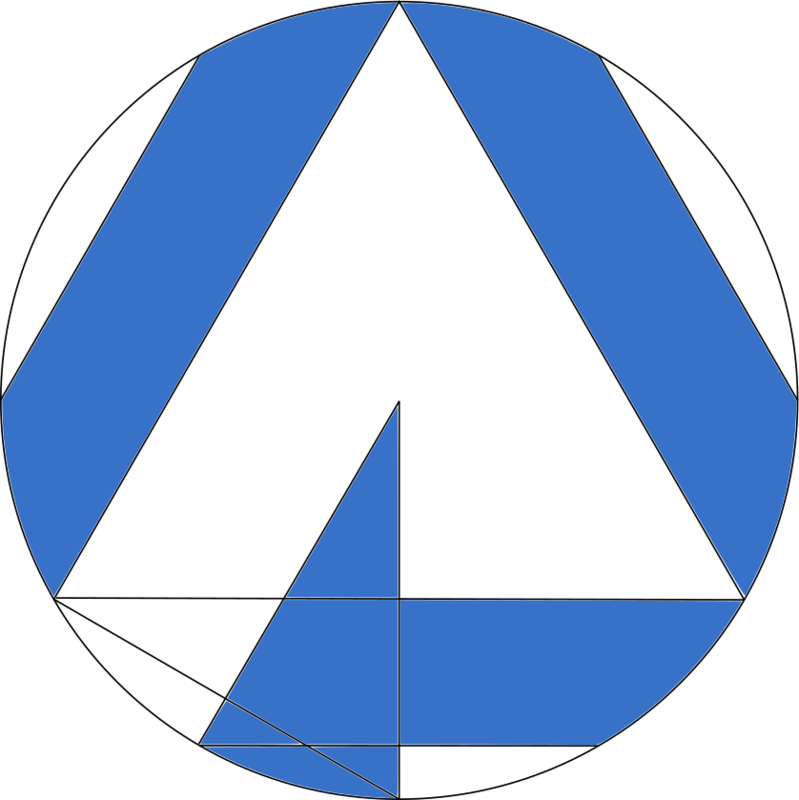 Shift the two shaded regions on the side downward by one hour, and draw in some radii: But now you have a couple of unshaded triangles near the sides that are congruent to the shaded triangles at the top. (You can work out why they’re congruent, right?) So you can move the shaded triangles to make two three-hour wedges. And once again, half the circle is shaded. 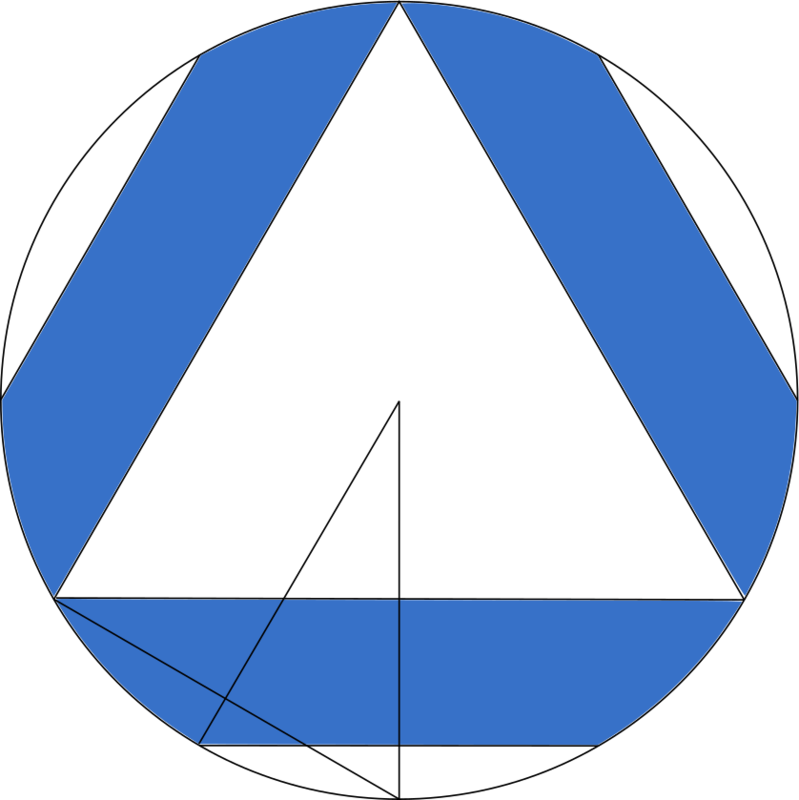 Start this by drawing a couple radii and a chord: Now on the lower left you have a region that’s sort of a right triangle with a curved hypotenuse which you can shift down to the bottom. And you again have a pair of congruent triangles, one shaded and one not, which you can swap. That makes half of one of the stripes into a one-hour wedge. So the three stripes have the same area as six one-hour wedges, or half the circle. Again! And this brings us to the one I had the most trouble with. It’s the only one I couldn’t do by the above dissect-and-rerrange techniques, and I don’t think it can be done that way. I had to resort to calculations, though not difficult ones once I found the way. Start by drawing some extra lines. 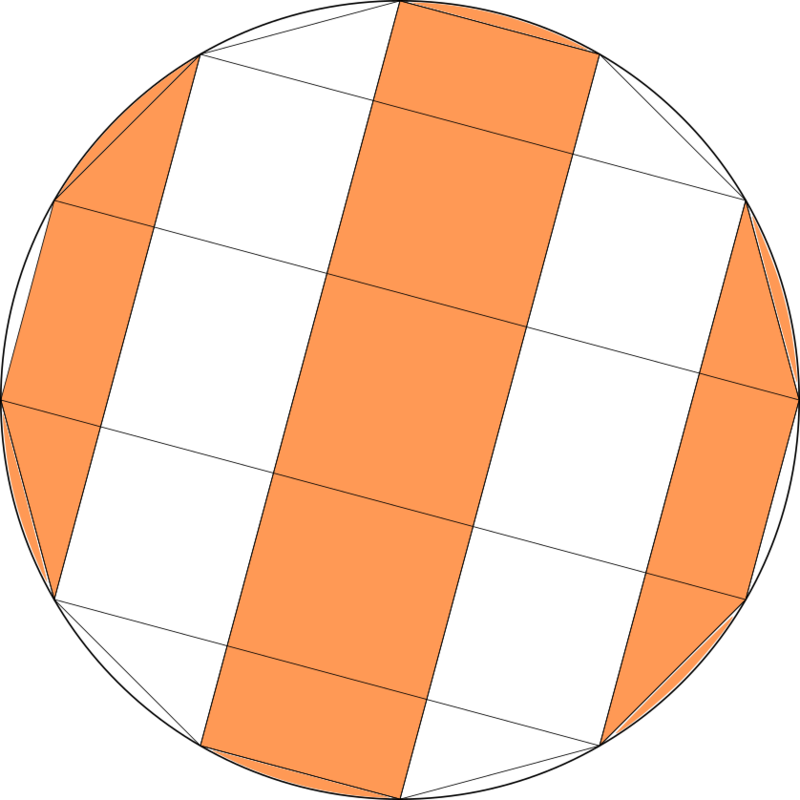 Now notice: There are 12 congruent circular segments (the little “caps” at the ends of each stripe and two more on the sides), six shaded and six not; they balance. 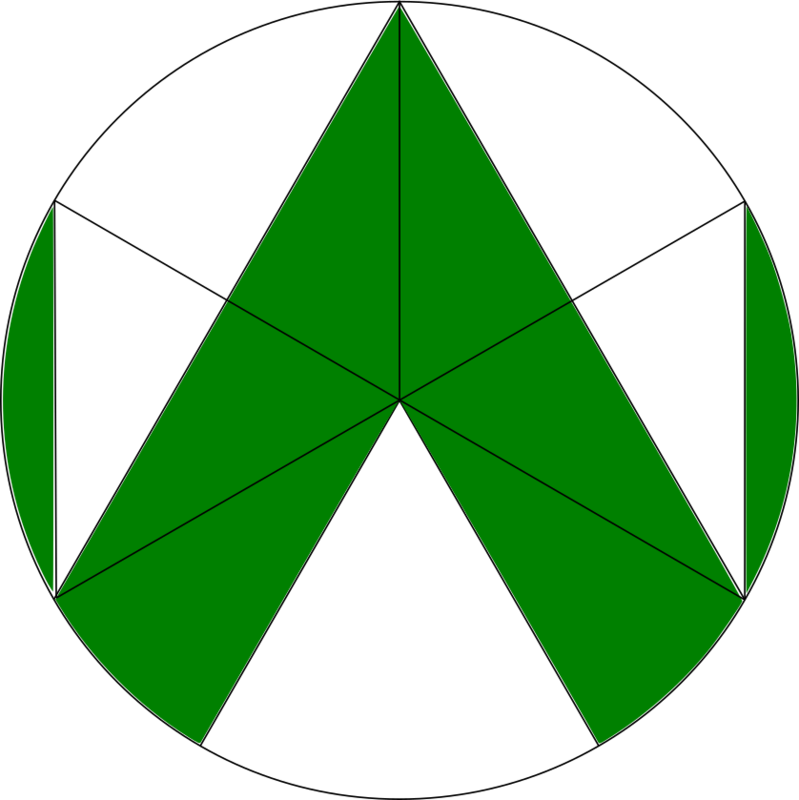 There are eight congruent triangles, four shaded and four not; they balance. 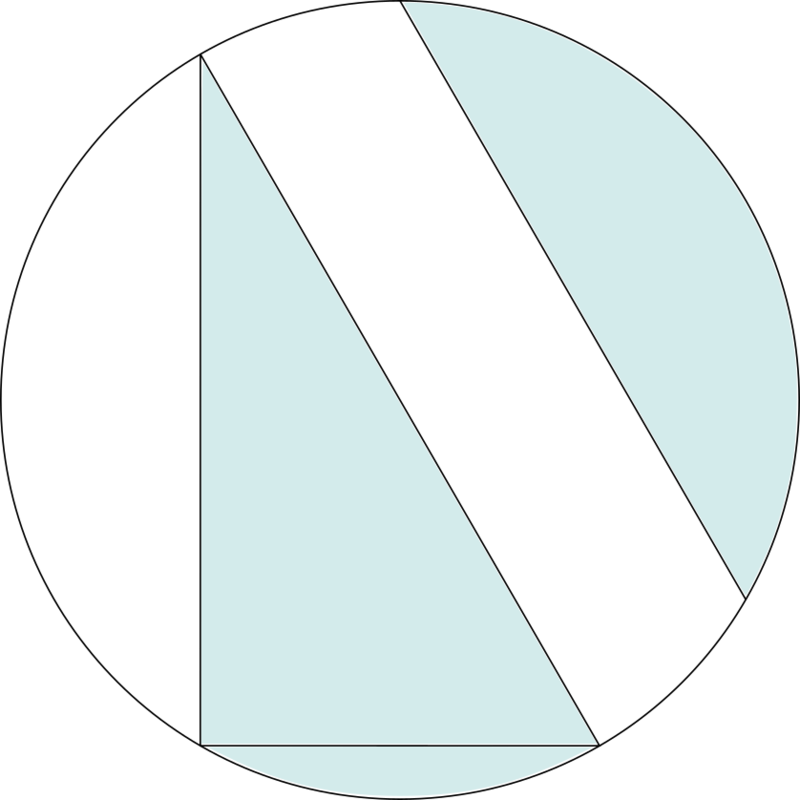 There are four congruent rectangles surrounding the central square, two shaded and two not; they balance. To cope with the rest we need some numbers. The triangles are , so if the hypotenuse is the short side is and the long side is . Then the remaining four shaded rectangles have area . The shaded central square has area . Total shaded area remaining is . The remaining four unshaded squares have area . They balance. So the shaded area is (wait for it) half the circle area. Finis!